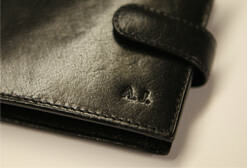 We offer a branding service for any of our products, we can also personalise your own goods too. Handbags, Purses, Wallets, Diaries etc…. We can brand your own logo, initials or any wording. Branding can be De-Bossed or Gold/Silver Foil.